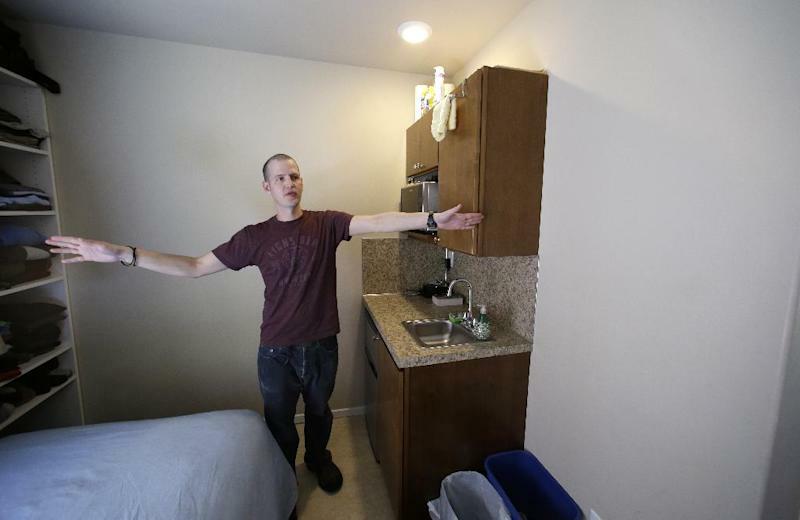 SEATTLE (AP) — Developers in Seattle have been leading the U.S. in building hundreds of tiny apartments — some about the size of a generous parking spot — to cater to solo young workers, retirees who prefer city living, students and others looking to downsize. Now, some residents are complaining that micro-apartments crowd too many people together, aren't compatible with some neighborhoods, don't encourage people to put down roots, and circumvent a design review process meant to get public input. They're pushing for a building moratorium and more regulation of such projects. "They're maxing out what they can do under the land use code," said Patrick Tompkins, who lives in the Capitol Hill neighborhood where some projects have replaced single-family homes, sometimes without much warning. The city code allowing such tiny units has been around for at least three decades, but micro-apartments have taken off in the last three years, said Bryan Stevens with Seattle's planning department. "It's really coincided with the recession. Apparently there's pent-up demand," he said. Since 2006, the city has permitted 48 micro-housing projects. If all are built, they would yield living quarters for about 2,300 people. 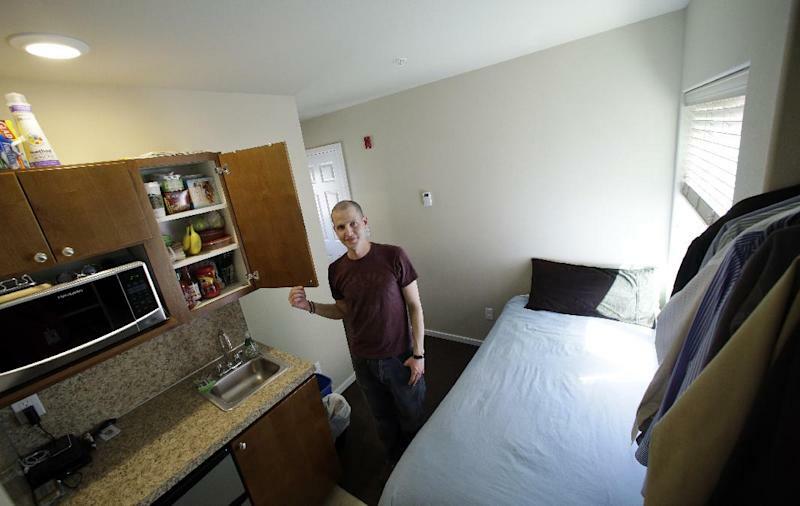 The micro-apartments range from 150 to 200 square feet for single occupants, with rents running about $500 to $700 a month and often include utilities, furnishings and Internet. Seattle code allows up to eight unrelated people to live in one dwelling unit, as long as they have their own individual living quarters and a shared kitchen. Projects meeting this threshold aren't required to undergo design review, which upsets opponents like Carl Winter. Winter, who supports a moratorium, isn't opposed to the projects but believes they can be built with more neighbor input. The city is providing an incentive for builders by not enforcing the normal regulations, he said. Supporters, including Mayor Mike McGinn, however, say the micro-apartments provide transit-friendly, affordable options for people who don't need a lot of space and want access to urban amenities. The mayor doesn't support a moratorium, said McGinn spokesman Aaron Pickus, but "we are taking a close look at the process for approval." City councilmembers are also weighing possible changes. A public forum is planned in coming weeks. In Seattle, about 41 percent of residents live alone, according to 2011 census figures. That makes such units appealing for some tenants, like Kris King. Though King was initially shocked by the size of the tiny apartment he rented in Seattle's First Hill neighborhood, it had everything he needed: it was walking distance to work, fit his budget and put him close to downtown for less. Other apartments in the area could easily top $1,000 a month. "I don't make a ton of money. This was appealing because it was affordable and it gave me access to a downtown market," said King, 36, who works as a counselor at a downtown Seattle homeless service center and pays $750 for his unit, roughly 120 square feet, which includes utilities and Internet. There's a demand for micro-housing because more people are living in single households, said John Infranca, research fellow at the Furman Center for Real Estate and Urban Policy at New York University Law School. He is co-writing a report on smaller housing units in cities across the country, including Seattle. "People are getting married later, divorcing at a higher rate, delaying marriage for several reasons, or are older individuals outliving spouses," he said, adding that "on a square foot basis, it's not affordable, but it's more affordable than other studio and one-bedroom apartments." Jim Potter, a Seattle-area developer who has been involved in five projects and is building more, said tenants in his units tend to stay a year or longer, want new construction for less or are tired of living with roommates or commuting to work. "We really don't have vacancies because this product is in big demand," he said. "We believe this market is very deep." 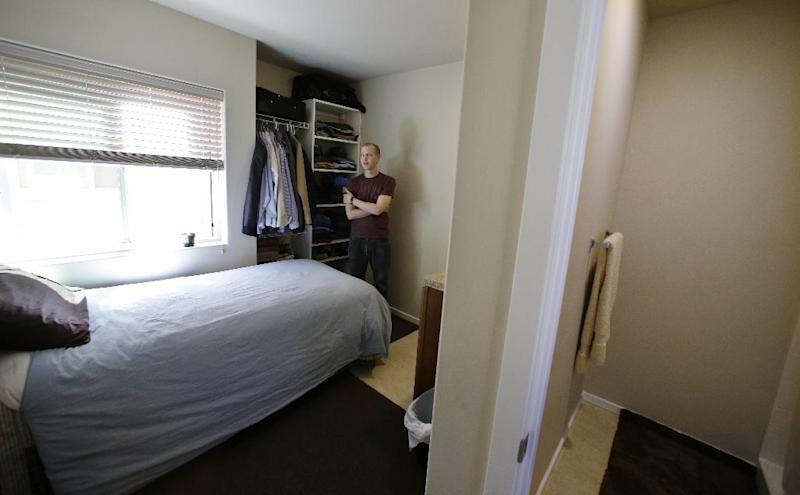 Freelance writer Matthew Amster-Burton, 37, doesn't mind micro-apartments popping up in his Capitol Hill neighborhood. "We need a transitional form of housing for people who are young, don't have money, or are new to the neighborhood. Some people will stay and some will move on, and that's fine," he said. Judy Green, a senior living on a fixed income, said she's happy in her tiny unit in Seattle's University District. "I can afford the rent. The unit is lovely and the building is attractive. It's nicely finished and it has large windows with lots of light. I'm comfortable with the size," she told councilmembers recently. "There's people like me that live minimally and are happy with a place like this." King's apartment comes with a small private bathroom, a microwave and a mini-refrigerator. There's just enough room for a twin bed, a neatly hung rack of clothes and shelves. He doesn't own a car, so parking hasn't been an issue. He works long and odd hours, doesn't cook much and didn't own a lot of stuff so finds the situation ideal, at least for now. "I like having my own space even though it's not much space," he said.